Do you ever have those moments when you’re supposed to be paying attention to something serious, but you’re immeasurably distracted by the bird species around you? For me, that experience encompassed an entire trip to Picayune Strand. 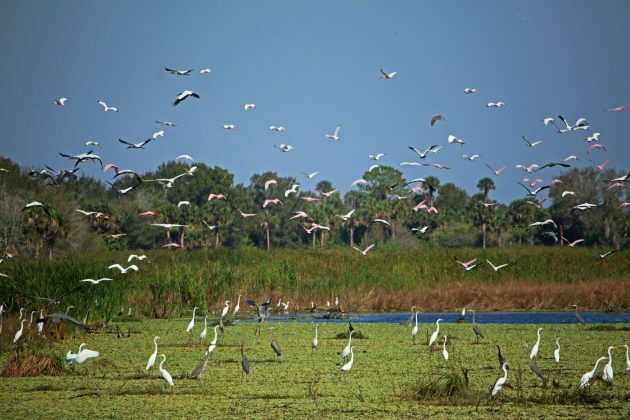 Located near Naples, FL, Picayune Strand is part of the wider Everglades. Unfortunately, it is also part of a failed housing development, and a grid of roads and canals still remain. While it’s true the roads and canals provide access to the wetland, they have also altered the historic water-flow downstream, which has serious consequences. It’s a party on top of this dead tree. Because of this, the 55,000 acres of Picayune Strand are now part of a restoration project led by the Army Corps of Engineers. 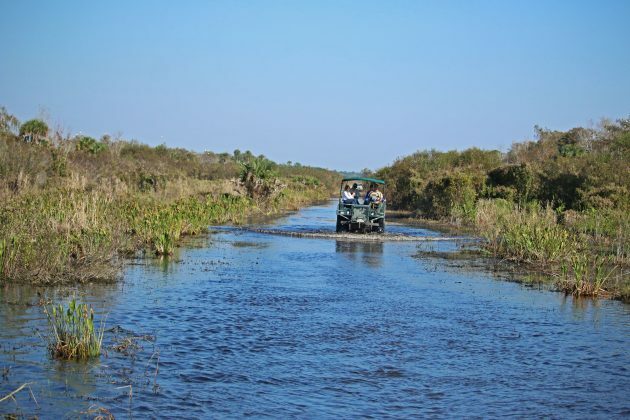 I visited as part of an environmental fellowship field trip, with every intention of carefully comparing and contrasting the restored vs. un-restored territory I passed through on top of a giant Swamp Buggy (which is basically an oversized golf cart). There was only one problem: THERE WERE SO MANY BIRDS. Exploring with our Swamp Buggies. As we traveled down the wet track of a restored road, Wood Storks, White Ibises, Anhingas, Great Blue Herons, Yellow-crowned Night Herons, American Bitterns, Wilson’s Snipes, Great Egrets, and so much more took to the air on wide wings, creating one of the biggest flocks of wading birds I’ve ever seen. In some places, so many Roseate Spoonbills joined the group that the sky appeared awash in pink. Belted Kingfishers cackled as they exploded from the trees, unleashing their anger in a vocal assault before finding new landing places. 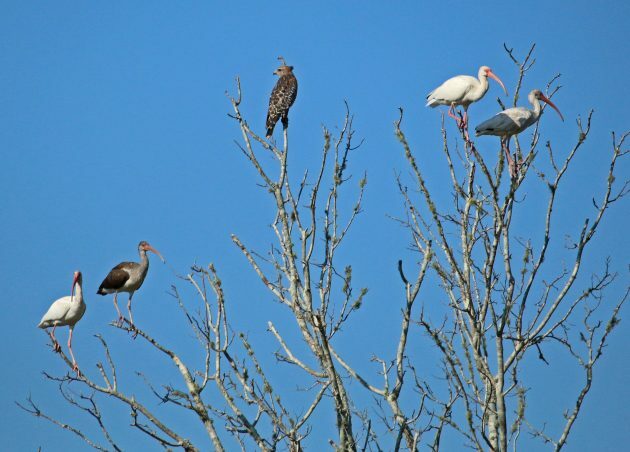 Raptors were also ever-present, perching on branches to stare solemnly down at our Swamp Buggy parade. Red-shouldered and Red-tailed Hawks remained the most common, while Black Vultures and Turkey Vultures sailed overhead on warm updrafts. I can honestly say that I’ve never seen so many birds in one place (ignoring flocks of starlings, etc). The experience really drove home to me how critical the Everglades are not only to Florida’s water, but also to its wildlife. Wow, just … wow! Incredible site and impressive Pictures. By the way, “Strand” is the German term for beach, but of course that might not be the origin of the name. Did they see the Wild Turkeys? Did any of you see them.